How to Strengthen Your Dog's Understanding of "Stay". What about "Stay?" Is the word necessary or not? So many people struggle with the idea of teaching their dog to Stay when in actuality it is one of the easiest things to accomplish. That is, it is easy to accomplish IF you build the concept of remaining in position into your dog's understanding from the very beginning. I personally never bother using the word "Stay" in my training conversation with the dog. I have no problem with those who wish to do so or see value in using "Stay," but for me it has just not been difficult to eliminate the word because I teach my dogs that staying IS the expected action if I ask them to Sit, lie Down or go to their Place. 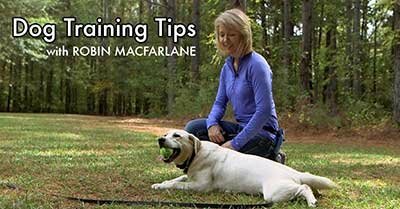 I start with very short intervals of time (seconds which gradually grow into minutes), and teach the dog that their ability to move freely again will come when they hear, see, or feel certain cues. In order for them to understand they are free to go, I build in what we call release or permission cues. We can use verbal, physical, or visual ones depending on our goals and the needs of our dogs (deaf dogs need visual or tactile cues). If you are interested in learning to do this, first pick a word that is unique in your everyday language. If you use the word "okay" frequently through the day, it may not be the best choice for a release or permission cue to your dog. Say that special word shortly after you have your dog Sit and help him initiate movement by prompting it either with a leash, taking hold of his collar, or using a welcoming gesture that gets him to move toward you. If your dog moves BEFORE you give permission, interrupt him and put him back. It really is that simple. Be consistent and take the time to put the dog back into the stationary position you asked him to be in. Remember to build up the time frames gradually. You can't jump from the concept of a Down/Stay of five seconds to one that is five minutes long in one session, but if you are consistent you'd be surprised how quickly you can add duration. Adding in distractions is another part of the equation for rock solid training, but we'll talk about that later. Take a look at this video to see a bit more of what I mean. Note: I'm using some remote collar training protocols in this video, thus the reference to tapping the e-collar if the dog makes a mistake. If you are not training with remote collar, keep a leash on the dog to interrupt his ability to break position. Next Article: Tired of Fido Stealing Your Snacks? Pull-Quote= Want your dog to learn to Stay? Then teach him when he can go!